Winter is coming . . . and so is Advent! The UCC Stillspeaking Writers’ Group has combined the best of both seasons in “Wonder,” their 2015 Advent booklet which includes a thought-provoking devotional for each day leading up to Christmas. Fifteen booklets have been ordered and will be available to purchase for $6 each. Reserve your copy by adding your name to the signup sheet on the Welcome Center. Contact: Twila Shankland. Since most of our youth group (and two of our youth leaders) have been at the Fall Youth Retreat at La Foret all weekend, we’ve decided to cancel YAC this evening. We’re going to let everybody get home, take a shower and a nap, and do some homework instead. BUT YAC will be back at its regular time (Sunday evening at 6:30 p.m.) and in its regular place (the Youth Room) next week. If you’re a youth between 7th and 12th grade, we invite you to join us as we do those things we do. Contact: Logan Bennett, Jacob Liechty, Jodi Bushdiecker. Sunday, November 1, 10:15 a.m.
Oh, when the saints . . . Oh, when the saints . . . Oh, when the saints go marching in . . . Do you want to be in that number? Or at least, do you want to be in the number who join us on Sunday as we celebrate All Saints Day? If so, please come. We’ll be lighting candles, remembering those who have gone before us, and listening to Pastor Curt preach about that great cloud of witnesses. And don’t forget that Daylight Saving Time will be ending, so set your clocks back! October is Domestic Violence Awareness Month, and Lakewood UCC is pitching in by supporting the Family Tree Women in Crisis Shelter supply drive. Sunday, October 18, October 25, and November 1, we’ll be collecting the following supplies: bath caddies, shampoo, conditioner, soap, body wash, lotion, deodorant, toothbrushes, toothpaste, Q-Tips, tweezers, nail clippers, hair brushes, combs, razors, band aids, and gift cards for make-up or other self-care items. All you have to do is bring items from the list to the church and place them in the bin in the Narthex. If you’d prefer to give a check instead, make it out to Lakewood UCC with “Women’s Crisis Shelter” in the memo line and drop it in the offering plate or the white dropbox outside the Church Office. Contact: Sue Preston. What’s fact and what’s fiction when it comes to the relationship between mental illness and violence? Join us in the Fellowship Hall for a special evening forum with Carl LoFaro of the Jefferson Center for Mental Health’s Veteran and Military Family Services, and Sergeant Kelly Karinen, the Crisis Intervention Training course director for the City of Lakewood Police Department. The discussion is FREE and open to the public. Light refreshments will be served, and you’ll get a chance to have your questions answered by experts in the field. Contact: Linda Royval. If you’re a youth from 7th through 12th grade, join us in the Youth Room for what we call “Regular YAC.” Regular, because we’ll be meeting at our regular time and in our regular place. But otherwise totally irregular, awesome, and extraordinary. As usual. Contact: Logan Bennett, Jacob Liechty, Curt Preston. It’s been a while since our last Adult Education offering, so we’re excited to announce that our CE Director, Jodi Bushdiecker, will be leading a class for three Mondays at the end of October and the beginning of November. Join us for a conversation about the role of the church in a changing world, based on a video series featuring some of the greats: NT Wright, Hannah Terry, Brian Zahnd, Walter Brueggemann, Richard Rohr, Rachel Held Evans, and Malcolm Guite. We’ll cover two videos per session, and each session stands alone. Come to as many or as few sessions as you want! If you need childcare, contact Jodi at least 3 days prior. Mitakuye Oyasin. It’s a Lakota term that means “all my relatives” or “we are all related.” Mitakuye Oyasin. 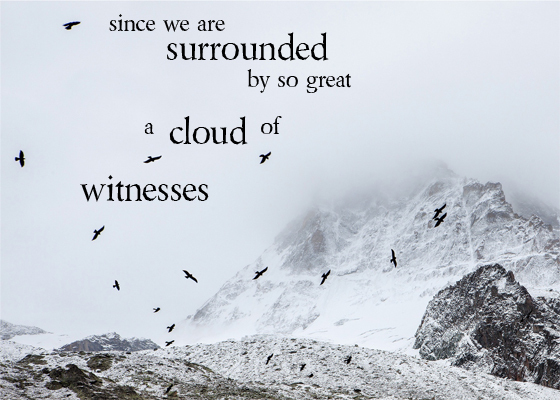 It’s used as the opening phrase or the refrain in many Lakota prayers and songs. Mitakuye Oyasin. It reflects the belief of the Lakota that everything on earth is connected. 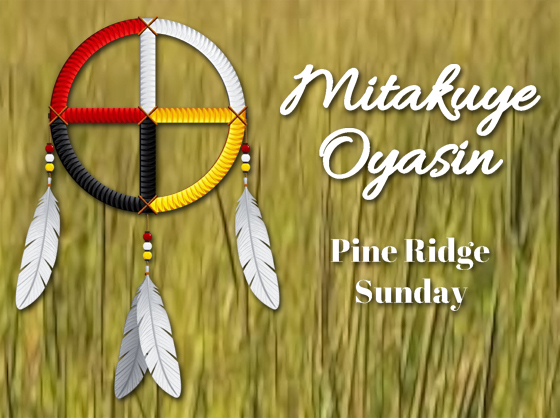 Join us on Sunday as the participants in our summer mission trip to the Pine Ridge Reservation lead us in worship and share what they learned from the Lakota people. And a special thank you to Lucy Preston for designing the image for this week’s Bulletin Cover and worship preview! Do you have a passion for hospitality? Does it warm your heart to see people mingling and chatting while they sip a warm beverage or munch on a snack? Do you love creating opportunities for people of all ages and stages to get to know each other better? If so, you’d be a perfect fit for Fellowship! The Fellowship Committee is looking for new members. Their next meeting is Monday, October 26, at the church. If you’re interested in joining them and finding out what Fellowship is all about, contact Tiffany Beastrom. Are you involved with a church ministry? Maybe you’re a member of a Board or Committee, and you’re excited about what your group has in the works. Maybe you participated in a church event this month, and you’ve got some photos or stories to share. Whatever it is, email it to the Church Office by this Friday (or drop it in the Office Manager’s mailbox), and it will be included in our monthly newsletter.